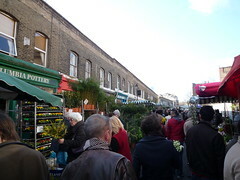 Columbia Road’s famous flower market was wonderful to walk through with the smells of hundreds of varieties and thousands of quantities. 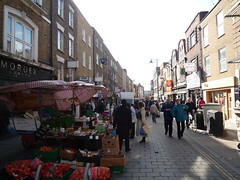 When I arrived early on Sunday morning things were buzzing and the street was bulging with vendors and customers. Along either side of the street and down some of the side streets are small shops also adding to the odour with their baked goods. The market doesn’t run the entire length of the road rather a reasonably small section at the end (between Ravenscroft and Shipton streets). It runs Sunday’s 8-2PM. 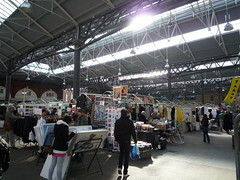 Next this Sunday was Spitalfield’s Market it has plenty of stalls covering clothes and jewellery to oysters in the re-fitted Spitalfields development. While the market benefits from quantity it does lose something in the atmosphere – or lack thereof. The development feels sterile and lacks a sense history. Various opening days, check the website for details. 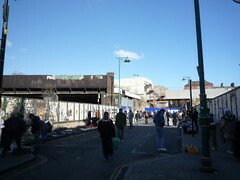 Brick Lane was rather disappointing. 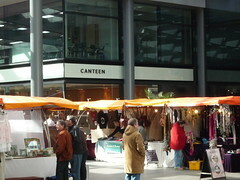 There was a smattering of stalls along the side and a few people standing around with items on blankets but nothing particularly worthwhile. 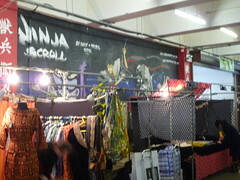 Along Brick Lane I did come across a building with many more stalls in the process of being set up. This could warrant a second glance. 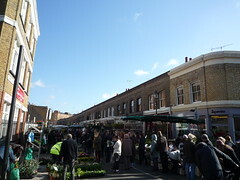 Both Spitalfields and Brick Lane websites advised their opening times but upon arrival at these markets things were being set up. I would like to see an optimum visiting time range on these sites to avoid people coming too early. 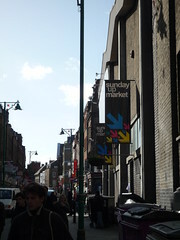 Spitalfields had a reasonable selection, Columbia Road had a good sensory experience and Brick Lane market is skipable.